To purchase a member’s ticket for this workshop (£5) please enter the code UP_MEMBER at checkout. You will need to show your membership card on arrival. Click here to find out more about the Unscripted Players. Please note: this drop in is now capped at 16 participants, to make sure everyone gets the most out of the session. Please book your ticket in advance to avoid disappointment. Learn new skills, explore, and have fun. Open to everyone, these drop-in workshops are suitable for beginners and up, taught by local and visiting instructors. 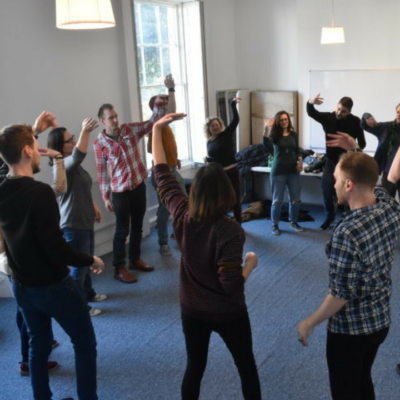 Each week brings a new workshop to stretch your improv muscles, learn new skills and meet a load of fantastic, friendly people. John Gallagher began performing in Aberystwyth in 2011, and moved to Bristol in 2016 where he joined the Unscripted Players and Kitchen Rules Theatre. He has performed with a number of improv troupes including 'The Inheritance', 'Macronaughts', 'Scenes To An End', 'The Billy Boys', and his one man show, 'One Board Man'. John regularly performs and coaches in Bristol, and has performed at numerous venues such as Hoopla, The Free Association, The Nursery, Nottingham Comedy Festival, Amsterdam Improv Marathon, and The Edinburgh and Brighton Fringe Festivals. He has trained with teachers from Upright Citizens Brigade, Improv Olympic, and The Free Association. He currently works as Production Manager for the Unscripted Players, and teaches drop ins for the Bristol Improv Theatre.